UPDATE: The Humboldt County Sheriff’s Office sent a press release with information about a later fire, found at 10 a.m. the same day, that was confirmed as an “intentional act of arson.” That fire, at the Hoopa Tribal Fisheries building, self-extinguished and caused only minor damage to the building. 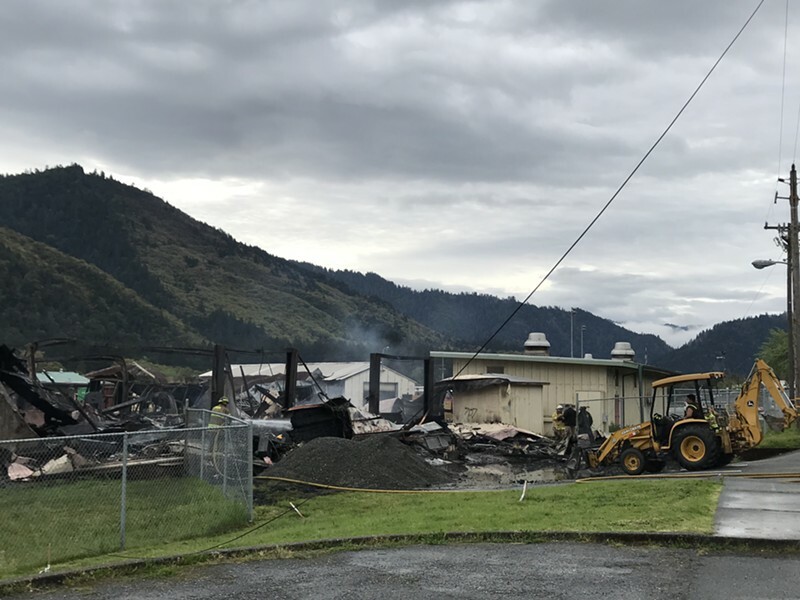 Three structures at Hoopa Valley High School burned this morning, with members of the Hoopa Volunteer Fire Department responding at around 3:45 a.m. The school's choir room, auto shop and woodshop were all destroyed in the blaze. According to the school's website, these structures were all closed due to mold and were being used for storage at the time of the fire. The school itself is closed for spring break this week. Stacy Hanson, public information officer with the Humboldt County Sheriff's Office, confirmed that the Humboldt County Arson Task Force is investigating the scene. According to an investigation by Allie Hostler of the Two Rivers Tribune, the Hoopa Valley has one of the highest rates of arson in the state. On 4-17-17 at about 4:15 am Hoopa Tribal Police reported a suspicious fire with three buildings involved, behind Hoopa High School on Loop Rd. in Hoopa. Sheriff’s Deputies responded to the scene and discovered the three buildings fully engulfed in flames. Hoopa Volunteer and Willow Creek Volunteer Fire Departments were on scene battling the blaze. The fire completely destroyed the Hoopa High School auto shop, wood shop and band room. At approximately 10:00 am Hoopa Fire then responded to the Hoopa Tribal Fisheries Building to a report of a smell of smoke in the building. The Fisheries building is located about 300yards from the scene of the original Hoopa High School fire. 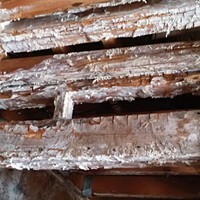 An investigation revealed that a fire had started under the crawl space of the building. The fire self-extinguished and only minor damage occurred to the building. 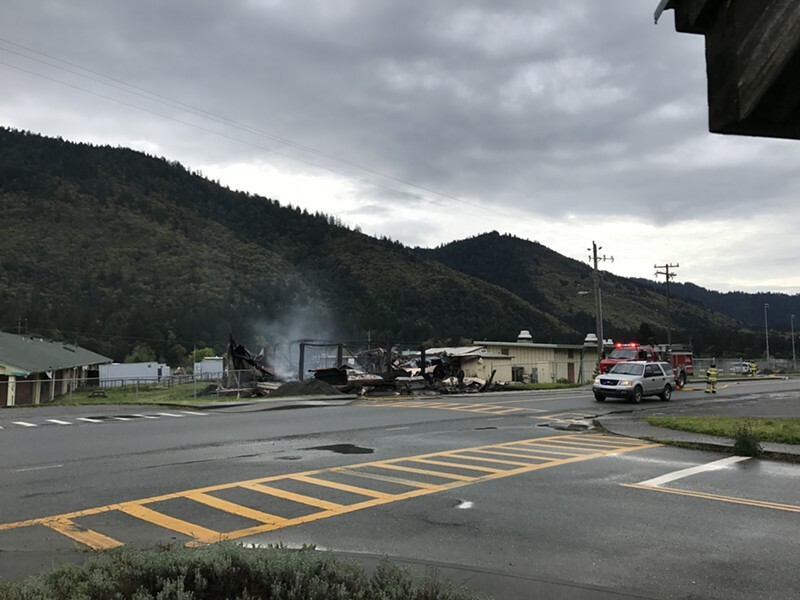 Members of the Humboldt County Arson Task Force responded to both scenes and determined the fire at the Hoopa Tribal Fisheries building was an intentional act of arson. Arson Investigators are still investigation the Hoopa High School fire and have narrowed the origin of fire. The fire is considered suspicious, however has not been determined as arson at this time. There are no known suspects or reports of injuries at this time. Anyone with information in regards to these incidents is encouraged to call the Sheriff’ Office at 707-445-7251 or the Sheriff’s Office Crime Tip line at 707-268-2539.